LONG BEACH— This season for the Atlanta Braves was a disaster to watch. But it is the type of revolting display this team has needed for quite some time. With Atlanta’s failure of a 2008 behind them they can no longer legitimately say that they only need to tweak a spot here or there. There were many holes in this team. Not every position needs improvement but each position will be evaluated to determine if it does. Today I will be looking at right field. Jeff Francoeur manned this position for the majority of the season. When he first came up he was the Golden Boy. He graced the cover of Sports Illustrated in his rookie season hitting .300 with 14 home runs in just 70 games. In his next season Francoeur lost his consistency at the plate. He increased his home run total but lost his overall power. 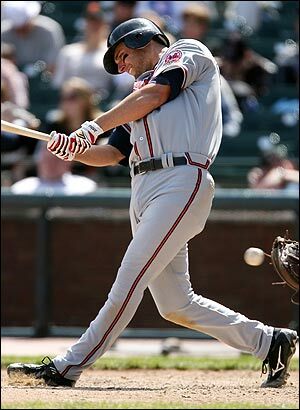 From 2005 to 2006 Francoeur saw his slugging percentage drop 100 points. His total at bats increased 153% in 2006 over 2005 but he only hit 4 more doubles. He hit home runs at a lesser rate going from one home run every 18 at bats in 2005 to one every 22 at bats in 2006. But the most alarming part of his game that season was his lack of strike zone competency. On base percentage measures the frequency of reaching base per plate appearance, not at bat. It includes walks and hit by pitches as well as hits. For Francoeur, walks were never his strong suit. In 2005 Francoeur managed to draw only 11 walks. As an overly aggressive rookie, this wasn’t terribly frightening. What was frightening was his follow up season. In 2005 Francoeur managed to turn 94% of his plate appearances into an at bat. He increased this rate in 2006. This means he drew even fewer walks and swung the bat even more freely the next season. In fact his total plate appearances increased by 150% but he only drew 12 more walks on the year. Another way of looking at it, Francoeur drew a walk once every 25 trips to the plate in 2005. In 2006 he drew a walk once every 30 trips to the plate. So he had his work cut out for him. In 2007 he was determined to improve his on base percentage as well as his consistency. He was successful. His batting average rose 33 points over the previous year and his on base percentage rose 45 points. He drew walks once every 16 plate appearances and reduced his overall rate of creating at bats by 3%. Unfortunately it came at a continued loss of power. His total home runs dropped by 30%. He didn’t hit a single triple after hitting 6 the previous season. But he did increase his doubles. He completed the year with solid, promising numbers including a second consecutive season with over 100 RBIs. Believing he had solved his consistency issues Francoeur spent the off-season of 2007/2008 working to tackle his power issues. So he trained hard in the off-season to increase his power. The results were the worst of his career. He took a step back in consistency, on base percentage and power. It was a train wreck. His doubles were down, home runs were down, walks were down, games played, total plate appearances, walk to plate appearance rate were all down. But to his benefit his strikeout rate was also down, the lone improvement in his game. On his blog he highlights how he finished the season strong. And he did improve down the stretch. Certainly better than he started. In his final 33 games Francoeur hit .280 with a .333 on base percentage. This compared to his first 33 games when he hit .263 with a .310 on base percentage. Although his slugging was higher to start, .436, over how he ended, .392. No matter how you break his beginning and ending down, he ended with less power than he began. Obviously his pre-season conditioning was inefficient. Now I could go into his League rankings and even his Major League rankings. But what’s the point? He was horrid. Measuring exactly how bad he was compared to his peers serves little to no purpose. Simply know that he was terrible this year and was a key reason the Braves struggled. He wasn’t the only reason, but he did play his part while doing his best impression of Raul Mondesi with a tomahawk. For the Braves to improve next year production from right field must improve. How can the Braves improve in right field? That’s not an easy question to answer. The other holes this team has prevents them from making a simple adjustment here by free agency or trade. Frank Wren, the General Manager of the team, has stated his hope and belief that Francoeur will improve. I tend to agree with him. Besides, it can’t get much worse than this season. Francoeur had returned to his normal playing weight by the end of the season. But it might be too much to ask of Jeff to hit 35 doubles and 25 home runs a year. With the future of the outfield appearing to be in the Minor League system (Heyward, Jordan and Hernandez) an improved level of production from Francoeur would benefit both parties as the Braves attempt to return to October ball and Jeff Francoeur attempts to cash in on the mega million dollar contracts. Unfortunately, until then Francoeur has hurt his own chances at riches and the teams options for dealing with him. Trading him now would be selling low. But if the right offer comes available, it might have to be seriously considered. The Braves most obvious need is reliable, strong, young starting pitching. And while Francoeur’s stock may have dropped recently, he is still young (24 years old), and capable of turning his career around. So other teams might be interested in acquiring him. Paul, I think JF can turn himself around. He realizes what he did wrong that put him in that position last year and seems to be correcting it. I sure hope he does!!! If he can just live up to his potential! Well I think his potential has to be taken down a notch. I thought he’d be a 30 homer, .300 guy. Obviously I was Braves Biased. But now I’d be happy with .280 and 20 Home Runs. But it would take a massive turn around for that to happen. He’ll have to spend a lot of his off season working on his swing and pitch recognition. And part of the pitch part is understanding the game. If he can go up to the plate with a better idea of what is going on he’ll improve. He just can’t force the power. That obviously doesn’t work.